You know, it feels crazy. 6 years ago, I started Enchanting Marketing. To be exact, I published my first blog post here on November 2nd, 2012. A great read – don’t keep up this level of detail or you will burn out! [Y]our content is singing girl. Keep it up. The truth is, I had no idea how I’d keep it up. I didn’t even know what my blog would be about … something about marketing or content marketing or … writing? I didn’t have a list with blog post ideas. Even worse, I didn’t see myself as a writer and I didn’t feel I had enough expertise to share. I was full of self-doubt. But isn’t it weird how you become a writer when you keep writing? I have rarely thought further ahead than my next blog post. But somehow I learned to show up regularly and to let ideas flow more freely. I learned to trust that I could always turn a scary empty sheet into a solid blog post. Below follow the 23 biggest lessons I learned during my first 6 years of blogging. I used to be nervous about running out of ideas. But the more you write, the more ideas you’ll have. For instance, each blog post has a loose end—a question unanswered or a detail worth exploring, which can spark a new blog post. We simply lose our ability to tap into our creativity. So, look after yourself well and do the work, and your muse will return. Negative thoughts swirl around our minds, spoiling the fun of writing. Thoughts like: I’m not creative. I’m not a real writer. My life is too boring. I’m not good enough. I learned to observe my negative thought patterns and change them. That’s how writing became a true joy. How do you turn a blank sheet into a piece of writing? You’ll never know exactly what you’ll produce. But when you establish a solid writing process, you learn how to turn crappy writing into shiny content. When writing becomes a chore, your writing voice becomes more monotone and a touch of dreariness sneaks in. So, write from your heart because it energizes your writing and inspires your readers. I found a real joy in challenging myself to understand a topic more deeply, to get to grips with the nuances of writing. When you narrow down your questions, you’ll never run out of ideas. For instance, learning how to write a good sentence is a relatively big topic. You can narrow down that question to: How do you write a good clincher sentence? Or how do you write an opening sentence? Tiptoe along the edges of your topic or take a big leap if you’re up for it. You’ll learn what resonates with your readers through experimentation. They’re a sign you’re stepping out of your comfort zone. You’re writing something that matters to you. So, don’t fight your fears. Instead: Dance. When I learned to set a timer and to challenge myself to focus for 25 minutes and then take a break, I became a lot more productive. When you try to fix details while writing a first draft, like adding an example or looking up a quote, you risk losing your train of thought. Leave some enthusiasm in your tank, so getting started tomorrow is easier. You can’t revise messy thoughts in your mind, but you can edit crappy writing. So, give yourself permission to write badly. A first draft is a starting point. Productive writers have a process for turning messy thoughts into writing, a plan to get started, and a toolbox to get unstuck. When we plan without overplanning, we can let our creative muse dance. Each blog post is different, and each time I thought I had found the perfect process, I hit a new stumbling block. So, the key was learning not to get frustrated and get myself unstuck. Your brain continues processing your ideas even when you’re not writing. So, when you spread your writing over several days, you get better ideas and you write faster. Instead, focus on communicating your ideas clearly and write from the heart. Your voice will appear as if by magic. When I drew a picture of my inner critic, I finally learned how to work with her. Perfectionism only turns ugly when you feel anxious about your writing and when you worry that others may criticize you. Writing on auto-pilot kills the joy of writing. So, if you get stuck in a rut, it’s time for a new creative challenge: Change your format, try storytelling, dream up a new metaphor or tiptoe outside your main topic. Creativity thrives on experiments and new adventures. The process of writing forces you to bring logic to your thoughts. An honest confession: I don’t just write for you. I also write because I enjoy playing with words and I have learned to welcome the challenge of formulating my thoughts. I have never taken your attention for granted. I’ve appreciated each of your comments. Even though I also write for myself, writing this blog has been a conversation with you. Thank you for cheering me on. Here’s to the next year of blogging! Awesome! Always inspiring content! Thank you very much! The biggest takeaway for anyone should be that ideas are never ending. Seth Godin writes a blog post every single day – he has been doing that for 20 years. Pewdiepie uploads a video every single day – he has been doing that for 10 years. So nothing to write about is something you will never run into. The second thing is to write for the joy of it and then you will unfold many things as you move ahead. P.S. On a side note, about loose ends in blog post – each of the sub-heading can become an individual blog post. And it’s been so interesting to see how things have unfolded just by following my curiosity. 6 years ago, I had no idea where I’d be now. Can we take a moment to appreciate the power in this statement? I have slowly been discovering that what applies to the rules of writing often applies to life in general, this statement confirms that. Imperfection is part of the process. Once we embrace our imperfection and learn to love it, we suddenly have the power to change it. It’s the great irony of life. Thank you for sharing this blog with its personal touches with us, it’s great to have tangible insights into your writing highs and lows – as the writer we all look up to. Yes, that’s so true. When I learned how to work with my inner critic when writing, I could apply that to other areas in my life, too. It has made a big difference! Thank you for your lovely comment, Dee. I appreciate it. I totally agree with each and every one of your 23 lessons. I too have been blogging for 6 years, and never ran out of subjects. When you are really into your subject, there is always more to investigate and write about. So, keep up the good work and above all keep enjoying what you do! Thanks for the tips. I will think about them. These insights are fantastic and well-earned. Thanks for sharing your wisdom. For me, the power of focus has been my biggest win lately. I’m working on a course, trying to get to the finish line, and it seems like it’s taking forever. It’s amazing how a half hour here and an hour there add up to something. Thanks again for this post. I’m looking forward to another year of your enchanting words! Focus is really a super-power, isn’t it? I have the same experience. Even when you can write only 25 minutes a day, the work will add up over time, especially if yo can focus during those 25 minutes. Good luck with finishing your course! I recently signed up for your writing tips. I have not skipped a single one in my inbox. You are soo great, giving people like me, who have been writing for years without giving it regard, a voice to be daring in our writing pursuits. Thank you for your awesomeness. You inspire me every day. Thank you so much for your lovely comment, Ncumisa. It makes me happy to read you feel inspired to challenge yourself to be more daring in your writing. Go for it! Thank you for your compliment, Dan. Happy writing! I loved #18, drawing your Inner Critic to get to know her better. There is so much fear in the unknown, and as Nelson Mandela said: If you want to make peace with your enemy, you have to work with your enemy. Then he becomes your partner. Wow, yes, that is so true. I hadn’t thought about it that way, but it’s true that my inner critic is more like a partner than an enemy now! I hear your thoughts and find that I have many of the same thoughts myself in many cases. I procrastinate because I think and I write then I rethink and change what I am Writing. That’s wrong I know, I must stop and make it a second writing time. I appreciate your thoughts, trails and fears because I have those and a few that are only my own. Please keep writing, I am learning so much. No one writing process exists that works for everyone, and sometimes revising while writing can work well. It only becomes a problem when you get so stuck in details that you lose your train of thought and forgot what you want to write. However, if you feel stuck and don’t know what to write next, rereading or editing what you’ve already written can be a good way to get unstuck. I, too, have blogged for a long time, but have begun to slow down. Reading all this makes me think I should go back to some of my first posts and just read. Seems that would rekindle some of that joy you mention. I also think it’s okay to slow down as our priorities shift. We can’t always do everything. When I changed my blogging schedule from weekly to every other week, I initially felt guilty about it, as if I wasn’t writing enough. It took me about a year to get used to the bi-weekly schedule and now I’m happy with it. Henneke, thank you for every word. I love your blog and adore the positivity, the attitude, and insights you share. I too have caught the writing bug but as much as I try it is always squashed by the procrastination rock. I do write some articles for work and I have used a ton of your suggestions. Keep it up, you have made a huge impact and your voice is delightful! Thank you so much for your lovely comment, Claudia. I used to be a procrastination champion, and it’s possible to adopt more productive working habit. Setting a timer has helped me a lot. Your advice is a treasure. I am grateful that I found you. Your blog always rocks. You and James Clear.com are my two favorite posts. You both have genuine and generous ideas given freely and well. Thank you Henneke. My courage is mounting. Writing and publishing regularly has definitely boosted my confidence, too. It’s not always stable—confidence ebbs and flows, but it’s definitely on the way up and it’s become easier to get through the periods when my confidence is dented. Happy writing, Patricia, and thank you for stopping by again. Loved this article – and all your posts! I am still amazed sometimes how much it helps me to spread work over more days. When I get back to what I’ve written the previous day, it’s always so much easier to see how to improve it. like usually, your writing so powerful and inspire me to write more Topics. I’m curious … was there something specific that you found helpful? Congratulations on your anniversary. Well deserved. I look forward to reading your pearls of wisdom for the next 6 years. Cheers, Mel. I feel honored you’ve kept me company for so long! A hearty LOL on #1 Henneke because I laugh when folks believe writing and seizing ideas leads to burn. Fear speaking there guys. The more you create, the more creative you become. Phenomenal list. Yes, it’s fear speaking, and once I realized that, I could learn to deal with it. While I love your content, and yes, I’ll probably purchase your course, can I be honest? I’m weary of the lack of grace & beauty in the current view, I cringe at off-color language or tawdry innuendos. I think you are amazingly talented and just don’t need to use those kinds of methods. I find myself stumbling over those references, both annoyed distracted, losing the focus of what I look to your content for in the first place. I’m sorry my word choice makes you cringe, Terry. Writing voice (and word choice) is such a sensitive subject, with people from different cultural backgrounds having different sensitivities. It’s not easy to write for an international audience, including both native and non-native English speakers. I try to stay true to my voice, even if that means that occasionally people feel annoyed with my choice of words. I know sometimes people unsubscribe because they don’t like the way I write. That’s okay. It’s not possible to please everyone all the time. I love the way you take the threads of writing advice, creative advice and life advice and plait them together throughout your blog. You take us along on your own journey and it’s both inspiring and companionable in the same moment. I’m encouraged when you share points like “An empty creative well does not exist” with a simple suggestion: take care of yourself and your muse will return. I also love that you advocate dancing with your fears. This is a creative courage of which I need constant reminding. Thank you for your bi-weekly conversations with us. I’m raising my water glass here and drinking to many more years of writing pleasure for you and us. I like your phrase companionable, because that’s how it feels to me, too. And it makes me happy you’ve been keeping me company for such a long time, blog post after blog post. Thank you. “Dance with your fears”. What a beautiful sentence, Henneke! I particularly loved the “Dance with your fears” and I believe that the fear is a sign that something good is bubbling up. Sometimes, I’m even right. It took me a while to get my head around that in the past few years, but I agree with you that fears are a positive sign. Thank you for stopping by again, Joan. I’m thankful for all your support. You’ve been commenting for quite a few years already! Yeah, yeah, I know, you did keep up that level of detail 😉 I am jealous. Not really, as that initial post had 45 different tips. I’m not doing such long list posts anymore! I did not scroll back to that post. So I had not realized how utterly sensible my remark was at the time 😉 But you have kept up great quality writing advice. I have really learnt alot from your website. Your tips on using storytelling techniques to enhance blog posts really helped me. Thanks. Firstly, I have to say this post is a very interesting reality check. Especially the method you utilize to more-or-less keep yourself in bounds. Dancing with your fears is one way of dealing with them that simply never occurred to me. Virtually every aspect of writing is simply a joy. I’ve been a weekly columnist for a small town newspaper for the past three-plus years. Other interests include poetry, philosophy and I’ve jus submitted my first manuscript for publication. There has been an interest in blogging but I’m simply uncertain, as you were early on, how to start and continue the process. How did you overcome this obstacle and does it, even now, sometimes plague you? I use various tactics so it’s easier to start a new blog post. For instance, I pick an idea and write a rough outline the day before I write a first draft (or sometimes a couple of days before). I also use a timer, so I get in my writing mode more quickly. I also write the parts I find easier to write first—so I skip writing a final headline and I skip the intro, and start with writing the main body of the post. It can also help to follow a “template”—a structure for writing a post. 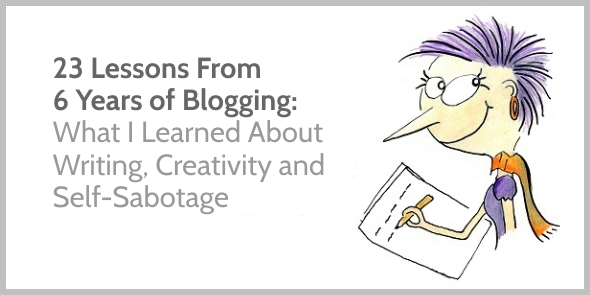 As you’re an experienced writer, I wonder whether there’s something specifically to holds you back from blogging? Do you know who you want to write for? Do you feel overwhelmed by setting up a blog (you could start on Medium or LinkedIn first? Or have you not decided what your blog will be about? I made some educated guesses on my blog niche and ideal reader profile (and changed both within the first year). Yes, please, Henneke! Keep up writing and blogging! Hi Henneke! Your content has always been a pleasure to read. Not only does it soothes the harsh voices in my head but also it tends to cultivate new ideas. I love the way you write and most importantly I love to be able to explore your writing. I am one grateful reader of your content! Thanks ? Thank you, Nusrat. I’m glad my blog is inspiring your writing. Thank you for stopping by ? Henneke! Let me tell you Ever since I launched my “how to make more money”, business and personal finance blog, you have always been a great help to my sustenance in inspiring my fans, and my readers’ lives. They always appreciated my magic in writing as a result of your influence. My fans are glad to enhance their finance and businesses with my business blog which has been a great influence from your blog. Thank you so much Henneke! God will continue to bless you! More greases to your elbow! Your source shall never run dry! . Woohoo! I’m glad you’re implementing my advice and paying it forward to inspire your own readers. Happy blogging, Godwin, and thank you for stopping by. It’s always a pleasure to read your writing. Sometimes it provokes, sometimes it soothes, but it’s always informative. Thanks for all your inspiration over the past six years. Thank you, David. That’s a beautiful compliment. I appreciate it! Thanks for the shoutout Henneke. Hard to believe it’s been six years. You are still singing and I so appreciate you and your work. God Bless and yes, please do Keep It Up! As a business with a blog attached we know the importance of adding good content regularly. However we often feel “too busy” to keep it up. You are really inspiring though Henneke and help keep us on the right track! I find it so interesting that some people thrive on challenges like NaNoWriMo and others hate such challenges. We all have to find our own ways for setting writing goals and nurturing a regular writing habit. Thank you for stopping by, Kim. And please don’t give up. Keep writing! Thank you Henneke for always showing your strength by sharing your vulnerability. You have been a tremendous inspiration. Especially dancing with your fear, is a special one and it’s one that you have been teaching through your posts for a long time already. I love that you emphasise that feeling emotional content that comes with creating certain content is actually a good reason to do it. You lead by example. Now if you don’t mind, I have some fears to dance with ;). That’s one other thing I learned … sharing my vulnerability doesn’t make me weak or seem weak. Thanks for reminding me, Rich! That’s been an important writing lesson for me, too. Thank you for being there. You and your writing are both awesome! ? You are very inspiring. I have loved every post. Congratulations on blogging for 6 years. I look forward to reading many more posts. Self-sabotage. Scared to write. It’s also my big problem. But after I read this entry, i realise that nobody is perfect and i must learn to overcome my negative thoughts. Yes, you can do it, Firdaos. Take it step by step! I’m so glad I found your blog today. I have been struggling with maintaining my new site. For me, it’s all to do with the crippling fear of not getting everything out of my head properly. So I really needed to read this post!! I am glad you found this blog post useful, Amanda. Remember, that you don’t need to get your ideas on paper in one go. You can just write a first draft, and then re-arrange your ideas so they become clearer! Thank you for another actionable post! I love, love, love Your blog! Your advice to change negative thought patterns and to show up regularly are spot-on. Getting into the habit of writing every day, even just a little bit, helps me to know that making a living with my writing *is* possible. And like you indicated, the more we write the easier it becomes to write more! In his book The Slight Edge, Jeff Olson makes the point that small actions we do on a consistent basis make all the difference. His point is that small actions are just as easy *not* to do, and so we often skip them. This also makes all the difference but in the wrong direction. Your tip to show up regularly is a step in the right direction. Thank you for the post! Yes, it’s easy not to do the small tasks that aren’t urgent, but they’re so often the tasks that are important to us and that make us feel good about ourselves. I try to do important, non-urgent tasks as early in the day as possible so I feel in a positive mood for the rest of the day. Thank you for adding your thought, Erika. I appreciate your comment! Self Sabotage is something i have struggled with in the past, that little voice in your head that says you cant do this! I’m learning to say “Yes” to as much as possible, this has helped my creativity no end. Inspiration is all around you, you just need to get out there! I like your idea of saying “Yes” more often!